With Breast Cancer Awareness Month drawing to a close, it's only right to shout your support from the rafters (or let your footwear do it for you). You've never been afraid of a little extra attention, so put on these pink ribbon print pumps by Miss Mary Mac. The pink sequined bow at the front and ribbon detail at the back give them a bit of sparkle & sizzle. Meanwhile, the 5 inch heel makes them a fun party shoe. Plus, the designer informed me that she donated partial proceeds from sales of this limited edition design to breast cancer research. 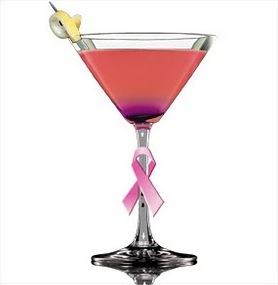 If you're going to wear pink ribbons on your feet, you might as well have a Pink Ribbon in your glass, too. Made with p.i.n.k. Vodka, Cointreau, cranberry juice, black currant juice and a splash of sour mix, it's a sweet-but-strong concoction. The caffeine and guarana in the vodka will give you the energy to party the night away. Just be careful not to have too many. A hyper drunk person isn't fun company. Plus, you're more likely to ruin your pretty shoes in an impaired state.